Today we continued on Highway 6 out of Queenstown and through the Karawau Gorge on the modern concrete bridge. The 1880 old bridge nearby became the world’s first commercial bungee jumping venture. You can still do this here if it is your thing. The road passes wineries and orchards. There is even a place called Bannockburn which is quite unlike the Bannockburn I know. When I was at school we could always remember the date of the Battle of Bannockburn as the local pub is called the 1314 Inn. 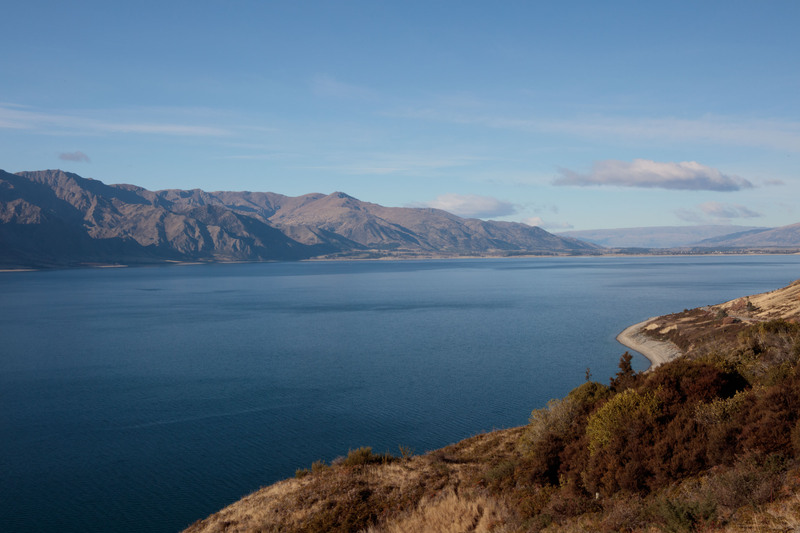 We could have taken a more direct minor road over a 1000m pass to our morning coffee stop at Wanaka but in winter this is likely to be very icy or snowy as it goes past a ski area. 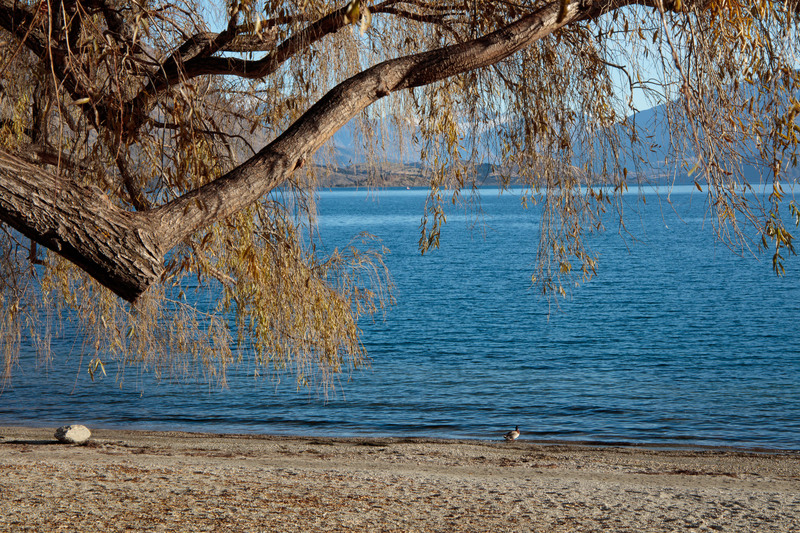 Wanaka is a smaller, quieter and laid-back place than Queenstown and might be worth considering for any future trip in the region. It has a very pleasant overlook onto Boys Bay. 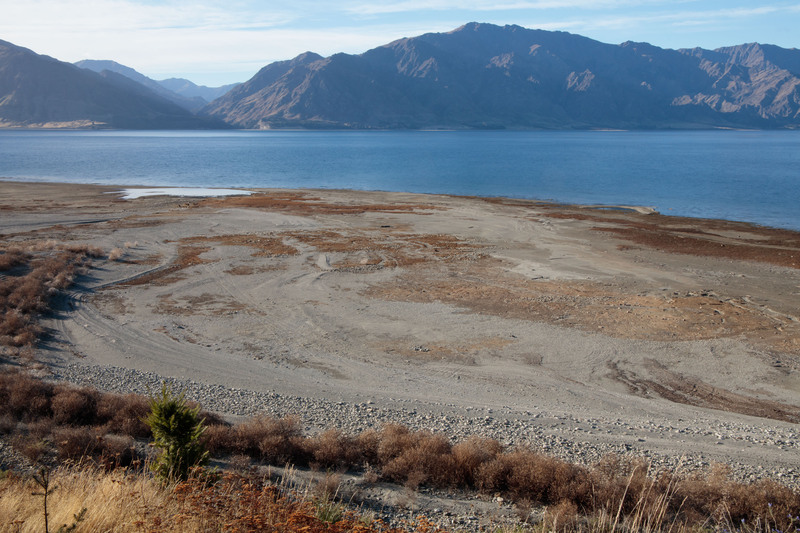 over a small neck of land and then back alongside Lake Wanaka. There was hardly anyone else on the road. Near Makarova we could see all the mountains around us. 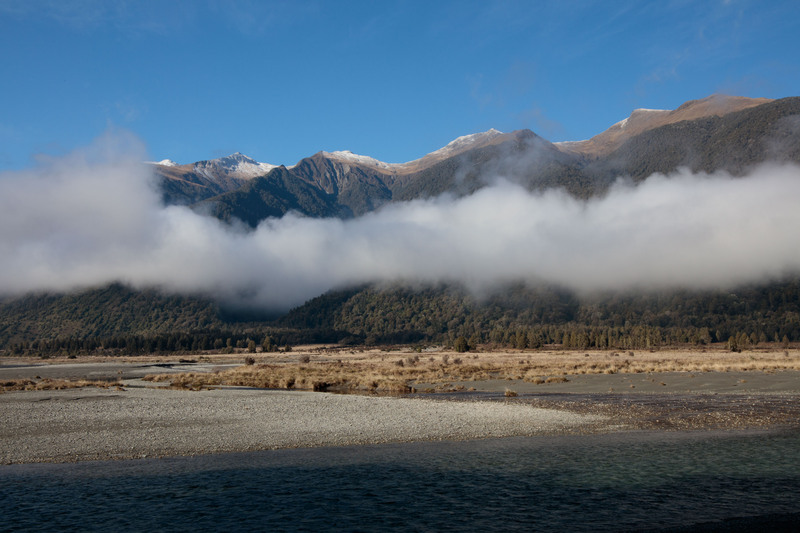 The Haast Pass is a bit of a non-event. It is 564m but as it is in the middle of rainforest, there are no views. 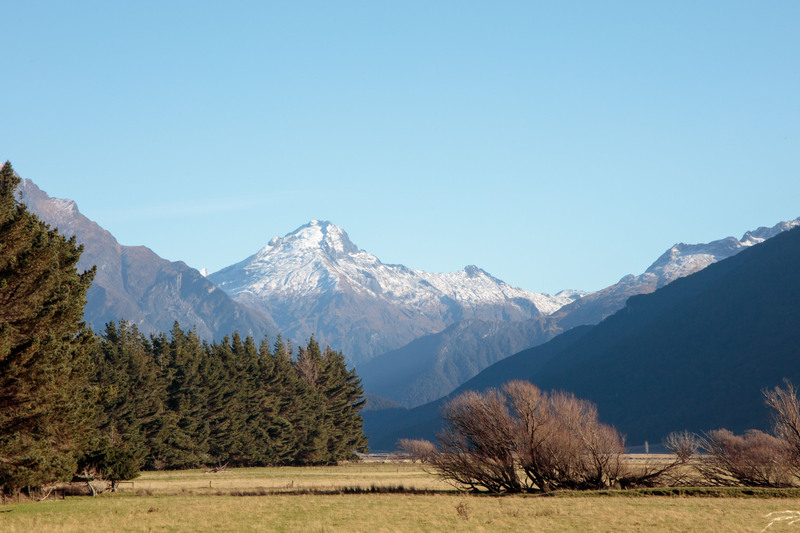 The early Maori had been using this route for a long time before the first Europeans appeared. It is named after a German Geologist, Julius von Haast but others suggest that Scottish Prospector Charles Cameron may have crossed it before him. The road was not opened to vehicles until 1965. 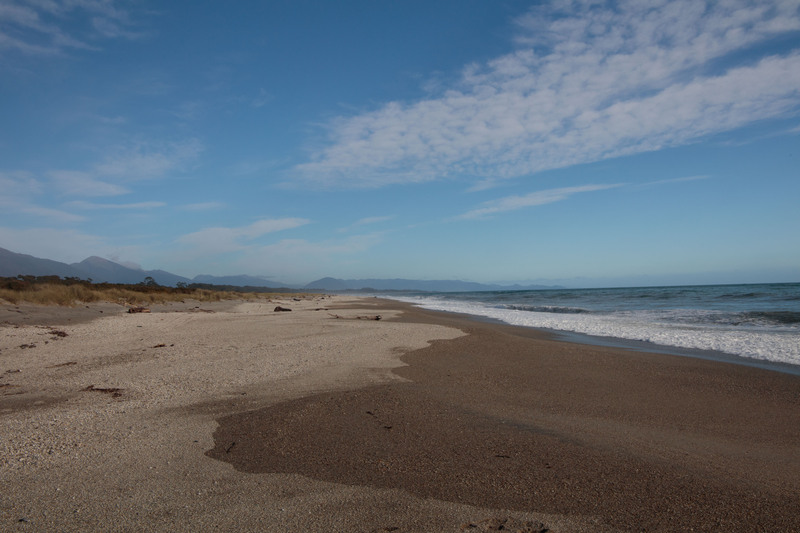 Highway 6 follows the Haast River right down to the beach. Various creeks are crossed on the way but the one with the best name was Crikey Creek. 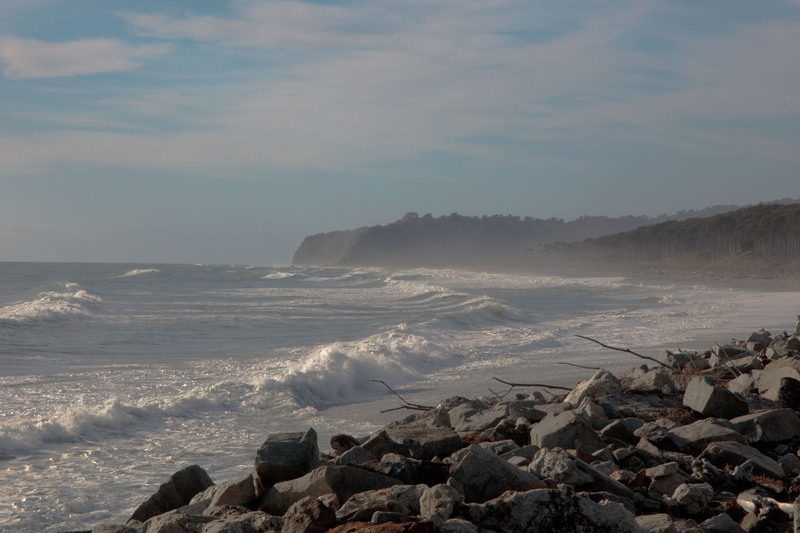 I could hear the Tasman Sea waves before I could see them but we had a walk on the beach after filling up with fuel. Mountains back onto the beach. Back on the highway we were soon at Bruce Bay where notices warn drivers about debris being blown onto the road in high seas. Our destination was the Fox Glacier. 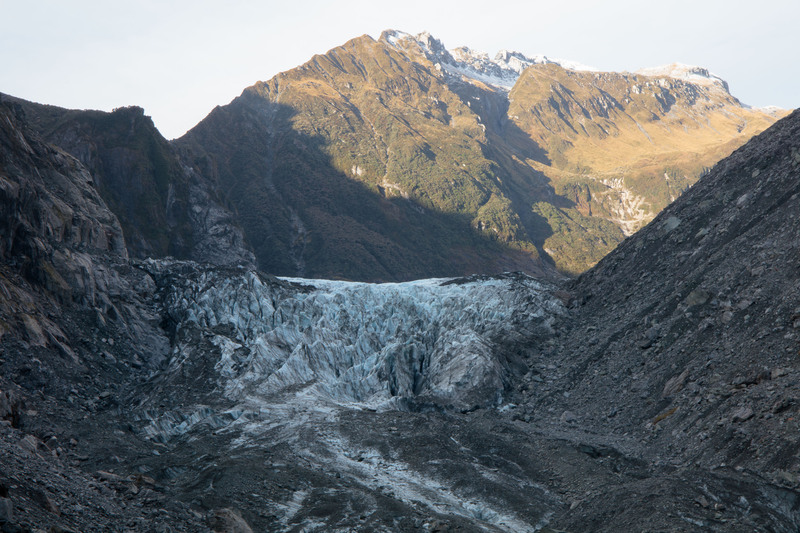 The Franz Josef Glacier a little further north is bigger but busier. Even at the Fox, you are advised to walk up the path before 8am or after 6pm in summer. There are numerous companies who will sell you guided walks on the glacier or helicopter rides but we chose the low key drive to the last carpark on the access road and then the walk up to it. The access road marks the face of the glacier in 1915 and 1935. It had even retreated and continues to do so since 2008. We made the 20 minute walk up to the viewing area a power walk as we had been sitting in the car rather a lot. Afterwards we settled into our motel in the village and are preparing for the longer drive tomorrow. 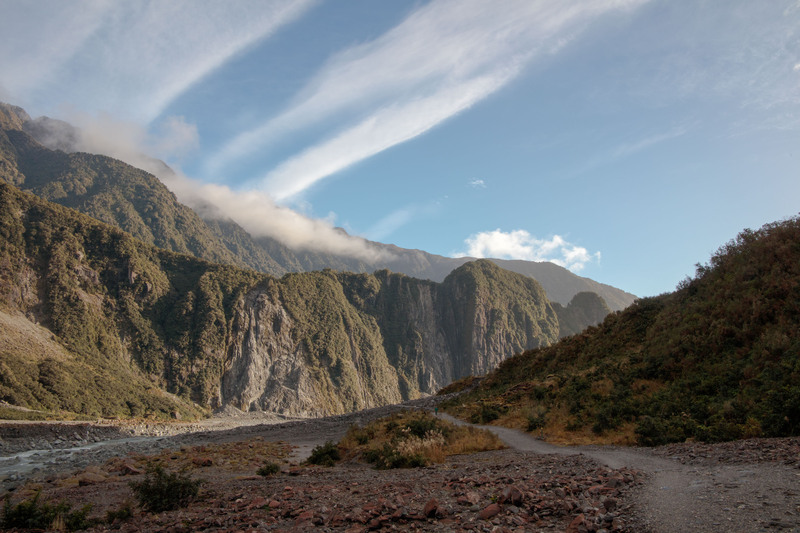 I’m loving these photos & descriptions of the places you visit – how cool to walk up to the Fox glacier. I can’t wait until you head up North!